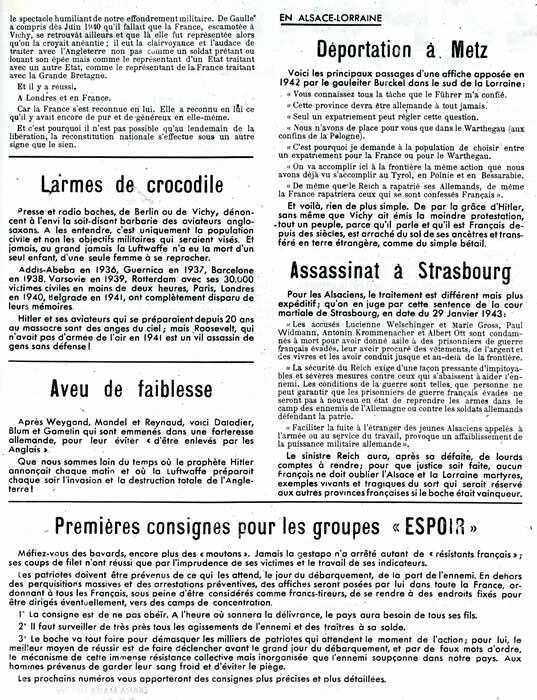 Eugène Marlot, resistor, published the underground newsletter L'Espoir from Dijon - details and see examples below! 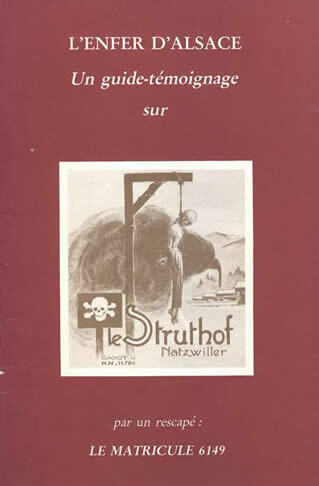 He later wrote the unofficial guide for Natzweiler-Struthof, L'Enfer d'Alsace-The Hell of Alsace which has been translated by Diana Mara Henry and is available by contacting dmh@dianamarahenry.com. and made sure to call the newspaper of his home town of Dijon to alert the public to her arrival and remind all of the horrors. 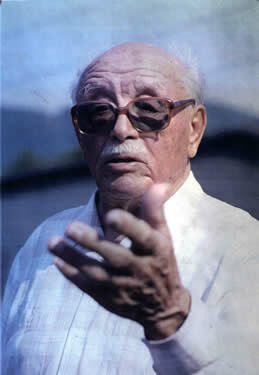 The photo below is of him speaking to them at the top of the camp. 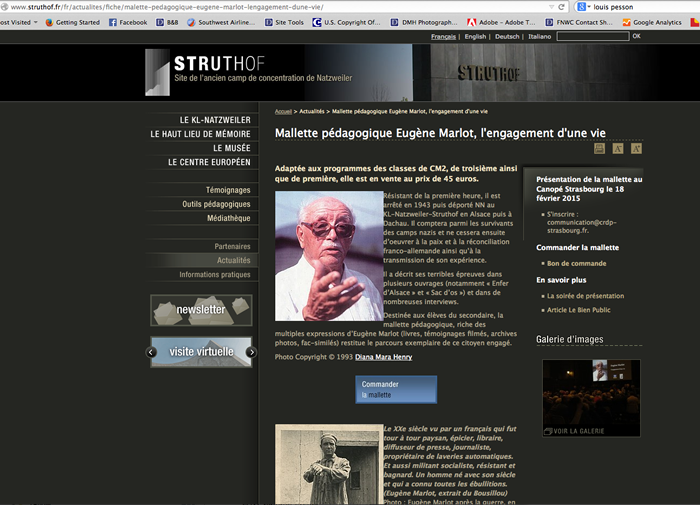 The poster below right is for a new exhibit in Strasbourg about Marlot. 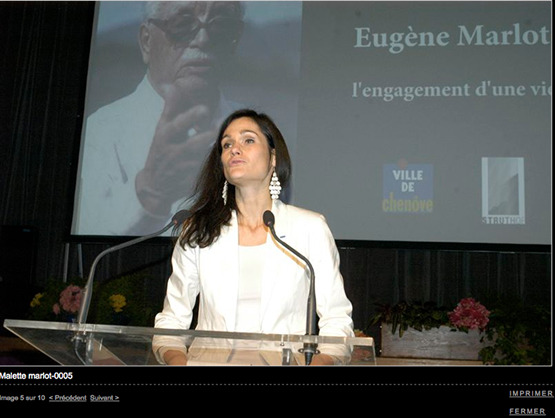 At left,, in 2013, Frédérique Neau-Dufour, Director of the Centre Européen de la Résistance et de la Déporttaion (CERD) the museum of Natzweiler-Struthof, spoke in front of an image of Marlot photographed by Diana Mara Henry at ceremonies kicking off the publication of a study guide ("Malette pédagogique") about him. 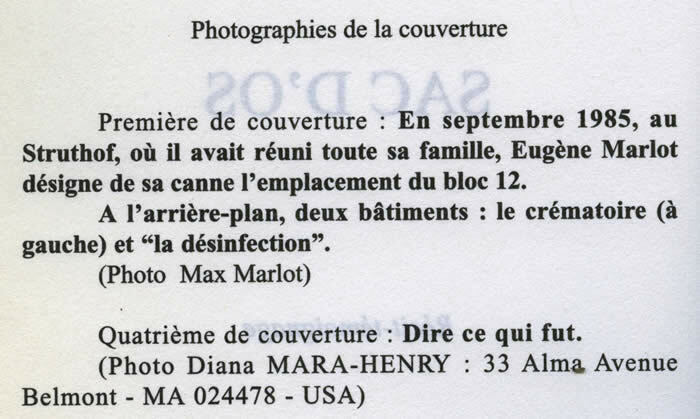 The translation of these memoirs was first undertaken as a source of caption material for an exhibit of my photographs of the Natzweiler-Struthof slave-labor and extermination camp. 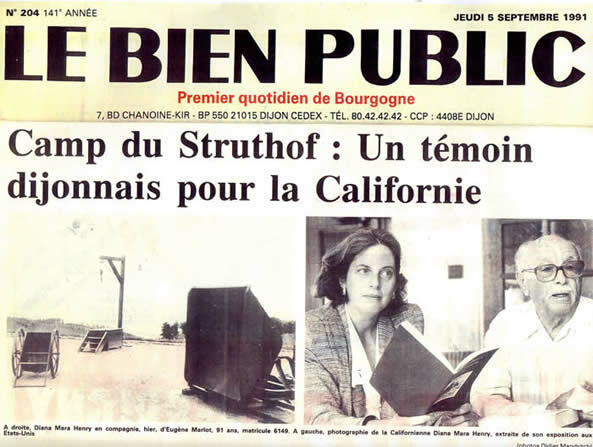 I made my first visit to this camp in the Vosges mountains of Eastern France in 1985, during a visit to my paternal grandfather’s hometown near Strasbourg, not far away from Natzweiler. The Nazis created this camp for political prisoners, first from Germany and then from all over Europe. Many were in the NN (“Nacht und Nebel”) category. 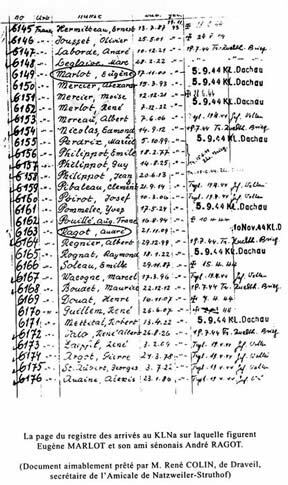 Forty-five thousand prisoners spent time there between 1941 and 1944; at least 12,000 died. 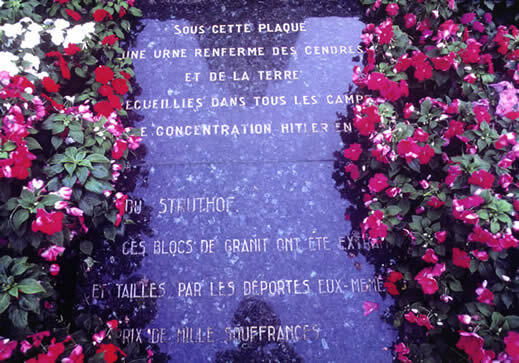 The camp contained all the elements of horror of the larger and better-known extermination camps. There were the gas chamber, the crematorium, the prison, the infirmary, the gibbet, the dissecting table - all on a gruesomely intimate scale compared to the gruesomely vast scale of Auschwitz. Jews did not survive Natzweiler unless they hid their Jewish identity or were in transit to other slave labor commandos; they were imported specifically to be gassed by Dr. Hirt, who obtained his orders to study their "racial differences" at the School of Anatomy at the University of Strasbourg. 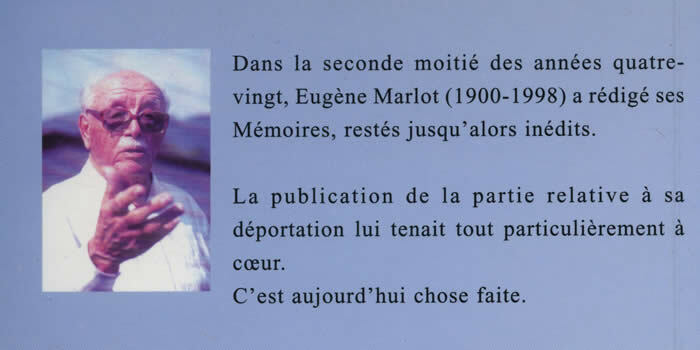 The Nuremburg documents collected by Serge Klarsfeld in The Struthof Album document the information Marlot provides here on the extermination of Jews and Gypsies in the gas chamber and by experimental procedures. The Nazis shipped the 8,000 live inmates back to Germany in the first days of September, 1944, as the Allies advanced into the region. Those who survived to the war’s end were liberated from Dachau, April 29, 1945. The camp’s commandant, Joseph Kramer, was executed by the British for his crimes as “the beast of Belsen,” the camp he had been transferred to in the last months of the war. After variously commuted sentences, all the other perpetrators went home to live out their lives with their families in Germany. 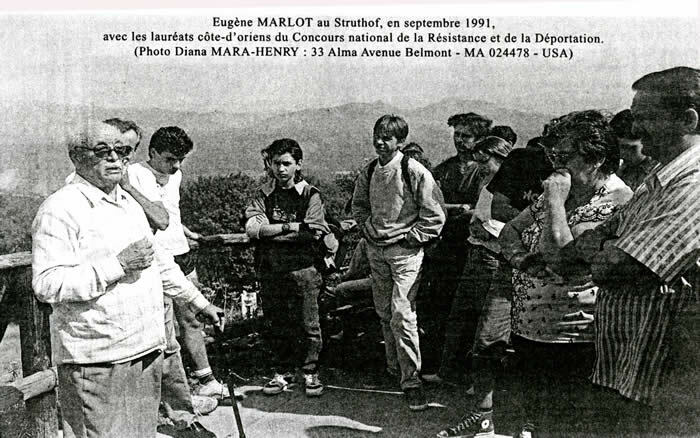 Left, Marlot speaking to school group at Natzweiler, 1991. 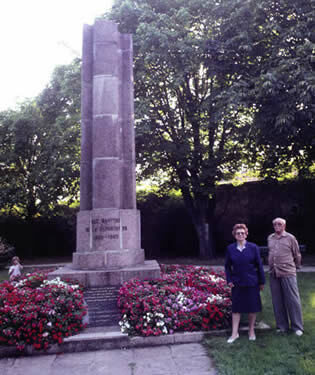 Right, he and his wife in the park in Dijon where he had a monument erected to the memory of the visctims of the camps. The inscription reads: "Under this plaque an urn encloses ashes and earth collected from all of Hitler's concentration camps. From the Struthof, these granite blocks were extracted and cut by the prisoners themselves at the cost of a thousand sufferings." 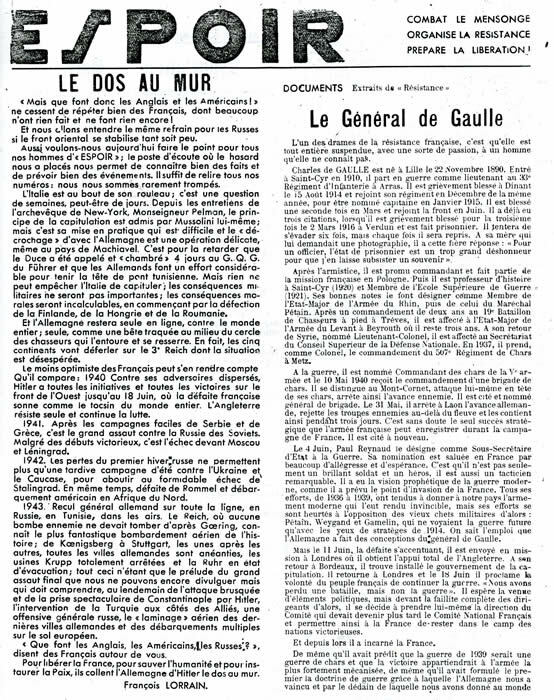 Photo from page 187 of Sac D'Os, Marlot's memoirs. Please contact Diana Mara Henry for publication-quality scans for distribution. The address given for her above is not correct. 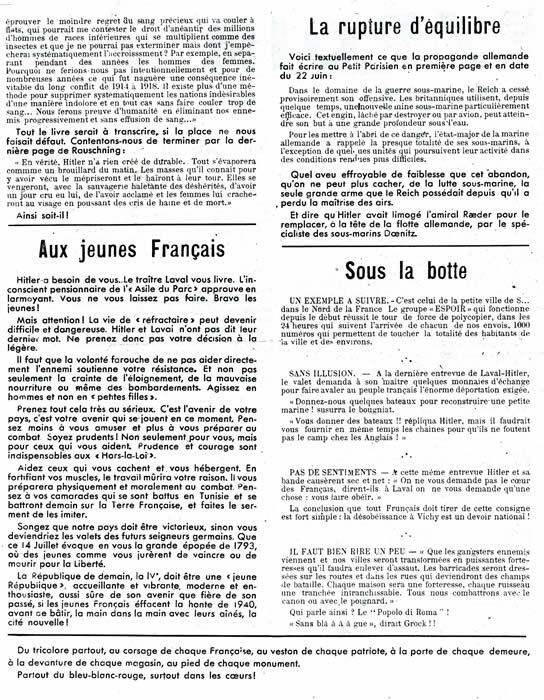 And now for examples of the underground newspaper, Espoir, published in editions of 3,000 and pedaled by MArlot on bicycle to the post office of every little town and village in Côte d'Or, to mail to the Mayor, the barkeep and the barber in each town, sincea mass mailing of 3,000 woudl have aroused Nazi /collaborator interest.As it turns out, when the printing press was raided, he almost escaped, until one of the policemen reached into the pocket of his printer's apron and pulled out fake id cards he was also producing to get young men out of forced labor (STO) in Germany. His authorship of Espoir was never implicated in his punishment in the camps. 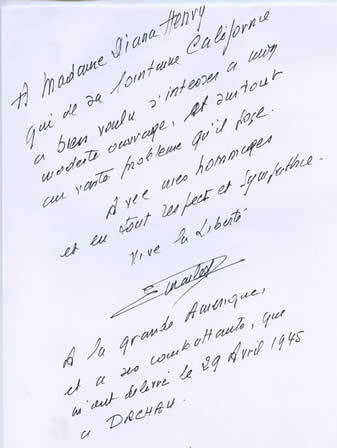 "I was arreested by Frenchmen, put into a French jail, and delivered to the Germans by Frenchmn on French railroads," he told me as we retraced the route of his internment in Dijon, where we were not allowed to photograph him in front of the prison, in 1991! Note: The Musée de la Résistance et de la Déportation in Besançon has a most impressive display of underground publications in Occupied France.